Of all of the beverages that exist on earth, I’d have to say that Champagne is my very favorite. 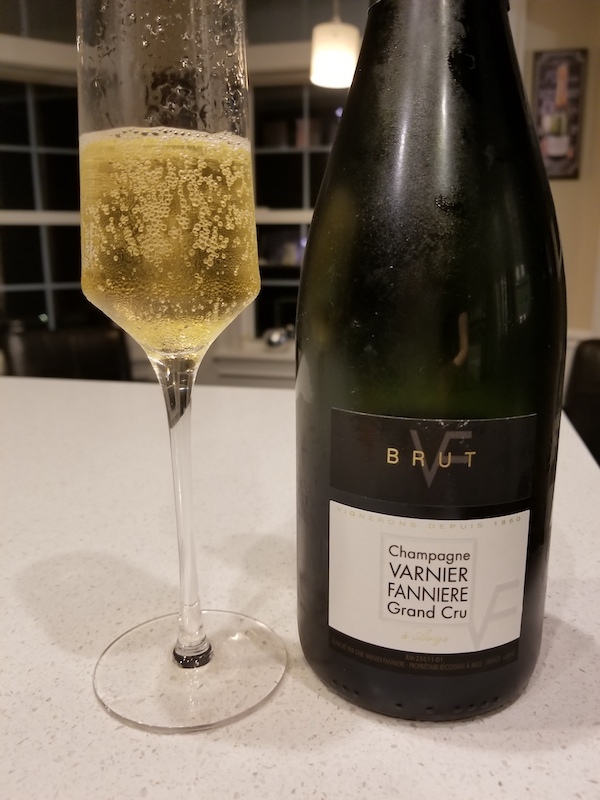 There is just something about the effervescence of the bubbles, the combination of fruit and yeast aromas and flavors, and the crisp acidity that keeps me wanting to drink more. Now don’t get me wrong! I love sparkling wine as well. I have some favorite producers out of California who really rock with bubbly that is made in the Champagne method. I also love a good Prosecco from Italy or a fun Cava from Spain. There is something very special, however, about the wines that literally come from the Champagne region in France. Yesterday I was in heaven. 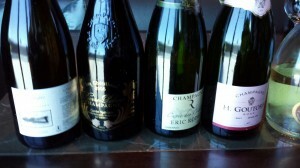 The Guild of Sommeliers hosted a Champagne Master Class in Miami. Oh, I was so there! 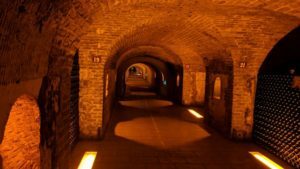 I knew that the chance to be guided through some of my favorite wines in the world by a Master Sommelier was a special treat and an experience I wasn’t about to miss. Master Sommelier Geoff Kruth (Wine Director at The Farmhouse Inn in Sonoma as well as the COO of the Guild of Sommeliers) started us off with a great presentation of the Champagne region. 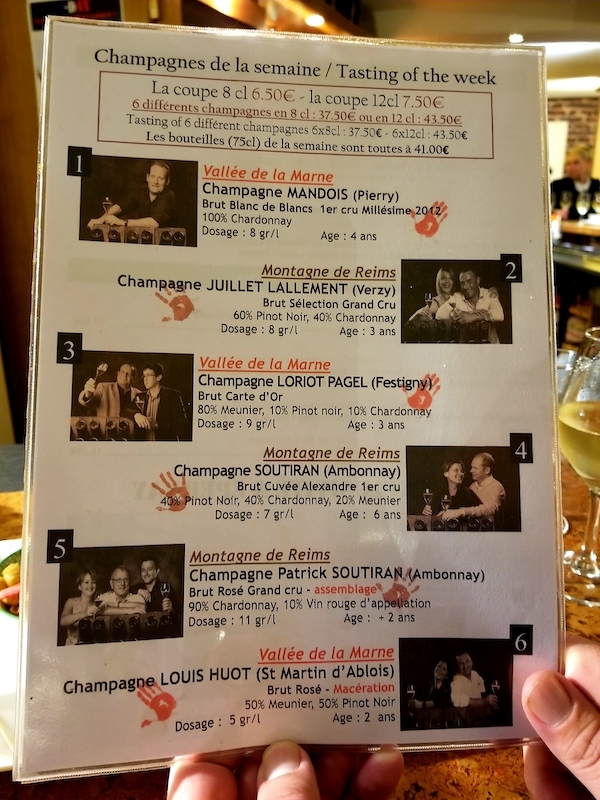 We then tasted four lovely samples of Grower Producer Champagne, which means that the same estate that owns the vineyards from which the grapes come produces these wines. 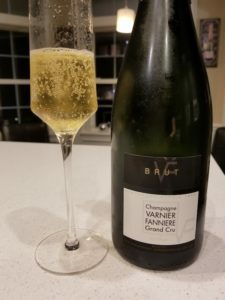 Brochet Mont Benoit Extra Brut – I’m not always a big fan of Extra Brut Champagne. 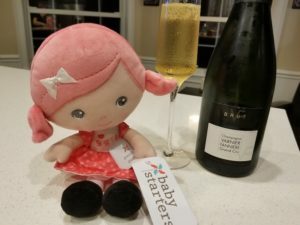 In my opinion, low dosage can sometimes make for a somewhat unpleasant wine, but that’s another blog for another day! The Brochet Mont Benoit, however, was quite lovely! They age some of the still wine in oak, which I loved on the nose. The oak with the low dosage makes for a very interesting wine indeed! Pierre Peters “Les Chétillons” 2006 –This is a lovely wine made of 100% Chardonnay, which means it’s a Blanc de Blancs. It has a racy, lemony nose and a wonderful mousse on the palate. Eric Rodez Cuvée de Crayères – This is a wonderful wine with 55% Pinot Noir and 45% Chardonnay. The Pinot Noir brings some nice red fruit to the palate, particularly strawberry and raspberry. This wine has some weight, so it can be paired with salmon or even lighter meats. Henri Goutorbe Rosé – Made from 75% Pinot Noir and 25% Chardonnay, this has some power from the Pinot Noir, and is almost like drinking cherry skins. The cherry blossom aromas are lovely. Next up were wines from Ruinart, the oldest established Champagne house in all of Champagne. Brand Ambassador Lacey Burke gave us a great presentation, and walked us through four examples of their wines. 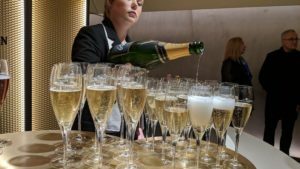 Ruinart Blanc de Blancs N/V – A great bubbly as an aperitif. Pears and citrus dominate. 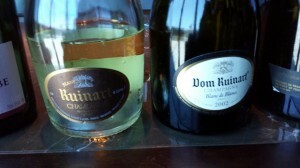 Dom Ruinart Blanc de Blancs 2002 – This is a lovely Champagne, one of my favorites of the day. As Lacey mentioned, this is Chablis with bubbles! It is lightly toasted with citrus and a wonderful mousse. This is drinking well now, but I wish I had a case for my cellar! 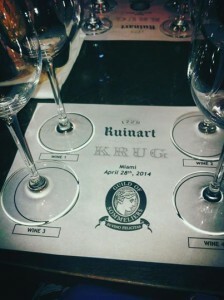 Dom Ruinart Blanc de Blancs 1993 – I love some age on wine, so this was fun! I thought that it was drinking perfectly now, with butter and yeast on the nose and palate. It reminded me of a loaf of bread, which I love! Lacey pointed out the sweet dill on the nose, which I totally got. I really enjoyed this wine! Ruinart Rosé – This non-vintage Rose is 45% Chardonnay and 55% Pinot Noir. 19% still Pinot Noir is blended into the wine to give it the color. 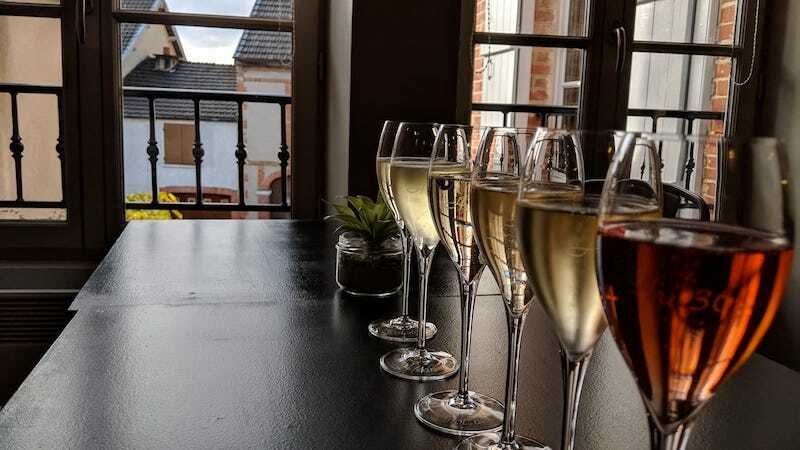 In France, blending still wine into the sparkling wine is only allowed in the Champagne region. Many producers believe that this adds more age-ability than the maceration process that traditionally is used. This wine tastes of pink grapefruit and under-ripe strawberries. 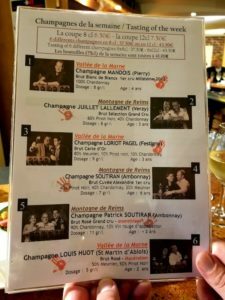 I love full-bodied Champagne (well, I love ALL Champagne, but you get the idea), so I was especially excited for the Krug portion of this tasting. 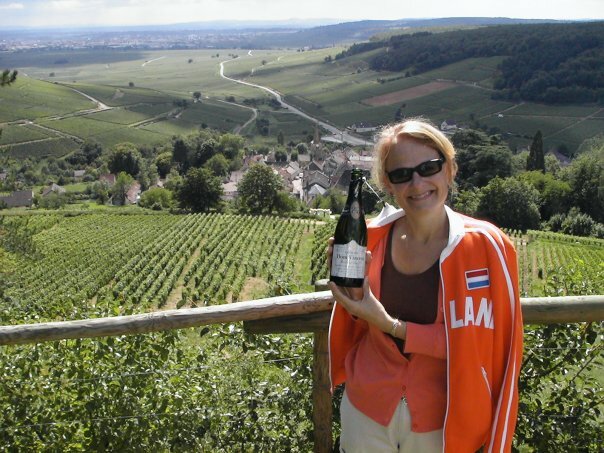 Krug Ambassador Nicole Burke (no relation to Lacey from Ruinart!) had us taste their first three wines blind, which was a lot of fun. She had us rank them 1, 2 or 3, with the Rose being wine number 4. She wisely figured that we’d be able to figure that one out! 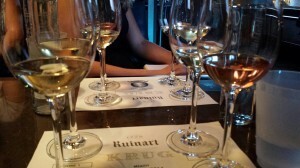 #3 – 2003 Krug Brut – This is 29% Chardonnay, 46% Pinot Noir and 25% Pinot Meunier. I loved the nose, which has a nice yeastiness and baking spices. There is great acidity on the palate with lemon and a touch of the baking spices. #2 – Krug Grand Cuvée – The flagship wine of Krug, this non-vintage wine is known as a magical and stunning mosaic of flavors. This particular bottling used base wine from the 2005 vintage, with the remaining wine from vintages going back 15 years, the oldest being from 1990. It has vanilla and baking spices on the nose, with apple pie and roasted nut flavors. 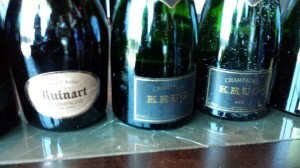 #1 – 2000 Krug Brut – Ranking these fabulous Champagnes was tough, but I picked this as my number one Krug of the day. Remember, I love some age, so maybe that had something to do with this being my number one! A blend of 43% Chardonnay, 42% Pinot Noir and 15% Pinot Meunier, this wine has vanilla, honey and almond on the nose. The palate was a ripe yellow apple, along with some pastry shell and a touch of ginger. It was aged in their cellar for 11 years before being released. The 2000 vintage was challenging in Champagne, with large sized hail in early July along with other problems. Houses wanted to do their best to produce a vintage Champagne for the new millennium. Not many did so successfully, but Krug’s 2000 is absolutely outstanding. We finished up the tasting with the N/V Krug Rosé, which has about 10% still Pinot Noir blended into the wine. How much fabulous Champagne can a gal taste in one day??? This Rose has some red fruit, brioche and rose petal on the nose. The incredibly round mouth feel does not take away from its charming delicacy. This was another winner of the day. A lot of people don’t realize that Champagne and other sparkling wines can pair very nicely with food. The acidity in the wine gives it the ability to pair with many different foods, from salads and egg dishes to all types of seafood and even lighter style meats. 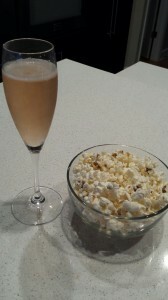 Don’t hate me fellow wine geeks, but my personal favorite pairing with Champagne is popcorn! Lacey also brought up another interesting tidbit of which I had never thought! Do you know that feeling when you’ve been drinking wine all night long? You drink it with the different dinner courses and then on into dessert and then you’re ready to go home and go to bed? Well when you’re drinking bubbly you don’t get that dragged down feeling! While I am writing this blog I’m drinking Champagne. Even though I just had a large meal, I’m feeling alert, alive and happy!!!! Who needs an after dinner coffee when there is Champagne in the world??? ?